James McGinn on these forums has advanced the conjecture, that liquid water evaporates not as a monomolecular gas, as customarily assumed, but in the form of "microdroplets" - liquid clusters of two or more water molecules held in cohesion by hydrogen bonding. Deriving directly from this is the hypothesis that moist air is heavier than dry air, again contrary to the customary assumption that moist air is lighter: Conventional science reasons that evaporated water forms a gas of single water molecules which mix with the other gases in air; that the molecular weight of H2O is less than that of the primary air constituents O2 and N2; that therefore the addition of water vapor makes the air less dense. McGinn proposes in contrast that microdroplets of N water molecules will behave as larger molecules with molecular weight N times the molecular weight of water; that these heavier pseudo-molecules will therefore make moist air heavier than air devoid of water. Or so I take the liberty of paraphrasing McGinn's ideas. McGinn has stated in support of the microdroplet conjecture, that the high level of intermolecular hydrogen bonding in liquid water creates the circumstance that actually it requires more energy to remove a single water molecule from the surface of liquid water, than that required to remove a cluster of two or more water molecules, in which the hydrogen bonding would be partially "neutralized". Now I will say, that I found there to be a certain seductive attraction to this revolutionary idea - could it really be true? I have no idea quantitatively how much energy it takes to remove a molecule or a cluster of them from a liquid surface. But the concept has a certain ring to it hinting at the possibility of an undiscovered truth. So it appeals to me according to my ways of thinking, similarly to other diverse non-mainstream notions: vast cosmic electrical currents in space; the world trade centers destroyed by controlled demolition; the Cheops Pyramid as not a tomb but some type of Machine built according to principles lost to modern science; etcetera. But then, again reading on this very forum, I was informed by Mr. Charles Chandler that in fact, according to modern science, humid air is less dense and will rise. Well I realized I had never actually thought about this... but, it seemed to be correct, and all my years of upside down shoes nothing but foolishness. Then again, now here was McGinn, arguing that actually the moist air was heavier, and would drain best downwards from my shoes and gloves. I was much troubled by this question, and resolved to determine the true answer. But it is not easy to make a direct and accurate measurement of the difference in density of moist versus dry air. You can try to create some rigid container, and weigh it containing dry and then moist air. But just some rough calculations will show that this requires making uncommonly precise measurements of weight, in addition to other practical difficulties. Similar problems arise in any related methods. I took two clean glass bottles, and wet them thoroughly inside, drying their outsides. I suspended them both upside down for several hours, to allow any dripping water to drain out. This left in each bottle, a random assortment of remaining water droplets, adhering to the inner walls. Then I inverted one of the bottles - so that now one was suspended upside down with the neck facing down, the other upright with the neck facing upwards. 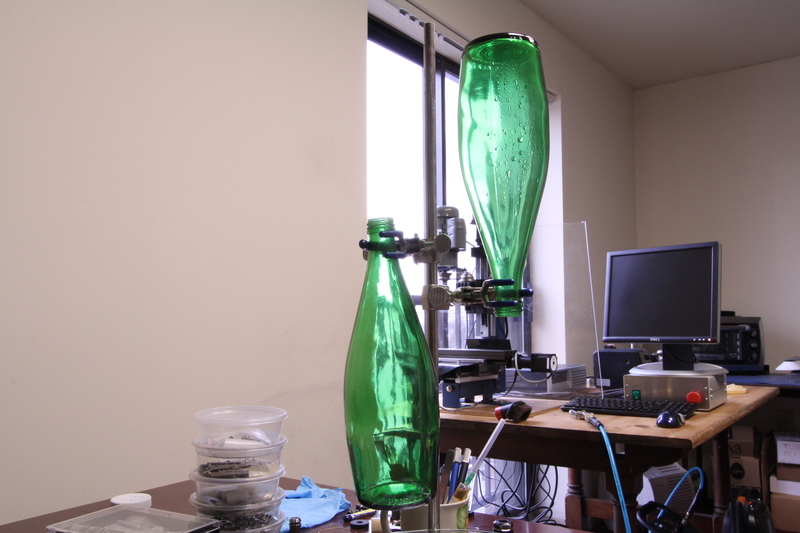 Now, I reasoned, if the humid air is less dense, it will rise out of the upright bottle, and that one will dry first. If the humid air is more dense, it will drain out of the upside down bottle, and _that_ one will dry first. In either case the humid air will be trapped in the contrary bottle, and delay its drying. -- There is the possibility that water continues to drain out of the inverted bottle. This would assist the drying of the inverted bottle, and therefore favor the "heavy humid air" hypothesis. Therefore I shook as much water as possible out of both bottles at the beginning of the experiment, and made sure to let them both drain upside down together for several hours. But still it would be a consideration to keep in mind. -- Evaporation will cool both bottles. Again this will favor the drying of the upside-down bottle and the "heavy humid air" hypothesis. Something else to keep in mind. As shown, there is a lot of moisture remaining in the inverted bottle, whereas the upright bottle is fully and completely free of any visible water. So it seems that humid air is less dense than dry air after all. In this case, the bottles were left in the shown position overnight. This is a room that I keep dehumidified and dust free with air filters, so it's quite climate controlled. However for the duration of the experiment all air conditioning, heating, fans, and filters were turned off, so the air in the room was still apart from normal thermal convection. Actually I tried this several times: Sometimes with the bottles positioned so their necks were at the same level; sometimes positioned so the bodies of the bottles were at the same level; sometimes switching which bottle was inverted, in case somehow one bottle had more mineral deposits on the inner walls, or otherwise retained more adhered water than the other for some reason. But always the result was the same - in the morning the upright bottle was dry; the inverted bottle was still wet. Henceforth I shall leave my shoes upright to dry, and try to educate my children to do likewise. Well played, the eternal contrast of logic with imagination. Also, the CRC book is in agreement with your conclusion. Engineering Toolbox wrote: Note! As we can see from (6) - increased moisture content reduces the density of moist air - dry air is more dense than moist air. 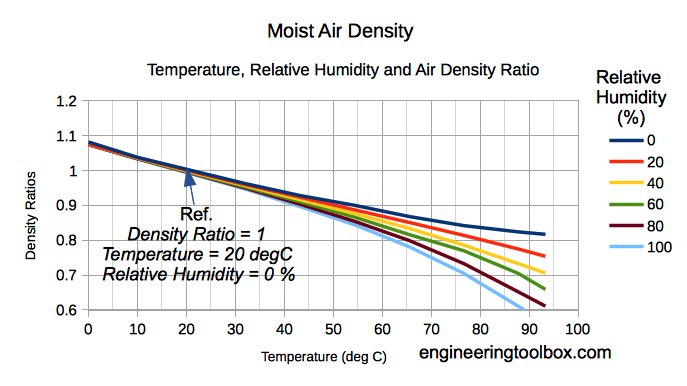 http://www.engineeringtoolbox.com/densi ... d_680.html <--- link contains math for calculating density of moist air. The following is in "Comments" after this story "Why dry air is heavier than humid air" in the Washington Post. Some other comments regarding Avogadro indicate the EU doesn't have an exclusive on humor. Since It’s for pilots, I needed an altimeter setting for atmospheric pressure. http://www.srh.noaa.gov/epz/?n=wxcalc altimeter setting to get the altimeter setting of 30.10 inches of mercury. Yes, the air in he room is stratified by temperature and moisture with more moisture in the air 68 inches above the floor than at the floor. Dave, I haven't seen where he has actually admitted that (perhaps have missed it), but i've been trying to give him all the encouragement i can, to do so. As has been observed throughout the centuries, water is very akin to electricity and may aggregate in many forms. "James McGinn on these forums has advanced the conjecture, that liquid water evaporates not as a monomolecular gas, as customarily assumed, but in the form of "microdroplets" - liquid clusters of two or more water molecules ..."
Is getting warmer to reality. Water has so many anomalies like how do snow flakes form and in so many unique shapes all based upon a central 18 sided theme. Hi Maol. Yes, there are plenty of charts and data tables to be found on the Internet, conforming with the reference you cite from Engineering Toolbox. Actually I found a similar one a few weeks back when I was looking into the question of the absolute water content of air, as opposed to "relative humidity", which is easier to measure and so more commonly stated. But the problem with all of these types of graphs and charts, in my opinion, is this: I would bet money, that virtually none of them are actually based on direct experimental data. Because performing those experiments reliably and accurately would be very challenging; very difficult. It's much easier to just assume that Avogadro's Law and the Ideal Gas Law apply with complete validity to air of various humidities, and furthermore to assume that evaporated water consists of a gas of individual H2O molecules. Then it becomes trivial to calculate any data as necessary to populate graphs and charts such as the one you cited. No messy and difficult and time consuming experiments necessary! However: Mr. McGinn has questioned the underlying assumption that "evaporated water consists of a gas of individual H2O molecules". So I presume that the first thing he would say, is that all of these charts are invalid, because they are based upon the questionable "gaseous water" premise. Is getting warmer to reality. Actually, I'm not attempting to make any statements or claims about the "true nature" of water; nor certainly about the existence of protons and electrons and molecules and so on. For this reason I named the thread, "Concerning the drying of wet shoes." Mr. McGinn claims that water evaporates to form not a gas, but "microdroplets". From this he derives the hypothesis, that moist air is heavier than dry air. He furthermore proceeds to construct and derive many fantastic corollaries and inferences about water, tornadoes, weather and climate systems, and so on. I'm not saying anything about any of that. However, given the possible implications related to hydrogen bonding, I thought that the "heavy moist air hypothesis" was at least interesting enough to investigate it a little. Hence the experiment with the bottles. My conclusion was, no: Moist air is not heavier than dry air. Moist air is lighter than dry air. And I feel that now I know for sure, the best way to dry my shoes! MosaicDave wrote: James McGinn on these forums has advanced the conjecture, that liquid water evaporates not as a monomolecular gas, as customarily assumed, but in the form of "microdroplets" - liquid clusters of two or more water molecules held in cohesion by hydrogen bonding. Yes. And thank your for correctly characterizing my position on this issue (that is rare). Interesting experiment. However, as I will explain below, there is a detail about my assumptions that you have not correctly characterized. Both of these respective hypotheses predict that air will rise, especially immediately after it evaporates. So this experiment doesn't distinguish between the respective positions/hypotheses. Meteorology maintains that it rises due to buoyancy (gravity). I say it rises due to electrostatic charges which I assume (I don't actually know) are prevalent in our atmosphere. MosaicDave wrote: Conventional science reasons that evaporated water forms a gas of single water molecules which mix with the other gases in air; that the molecular weight of H2O is less than that of the primary air constituents O2 and N2; that therefore the addition of water vapor makes the air less dense. When you do the math all the way through you will see that at most there is a one percent difference in weight. Do you think a one percent difference can power a Hurricane. I don't. MosaicDave wrote: McGinn proposes in contrast that microdroplets of N water molecules will behave as larger molecules with molecular weight N times the molecular weight of water; that these heavier pseudo-molecules will therefore make moist air heavier than air devoid of water. Or so I take the liberty of paraphrasing McGinn's ideas. Yeah, you got it right. Generally clear moist air is 3 to 7 percent heavier than dry air. McGinn has stated in support of the microdroplet conjecture, that the high level of intermolecular hydrogen bonding in liquid water creates the circumstance that actually it requires more energy to remove a single water molecule from the surface of liquid water, than that required to remove a cluster of two or more water molecules, in which the hydrogen bonding would be partially "neutralized". Now I will say, that I found there to be a certain seductive attraction to this revolutionary idea - could it really be true? It is true. See my post "Lookout For Bill" for details. The polarity neutralizing effect of H bonds are actually not as complicated as people think, especially if they are not intimidated by quantum mechanics. And this strangely counterintuitive mechanism is the mechanism that underlies ALL of H2O's numerous (upwards of seventy and counting) anomalies. Thanks for taking an interest in this Dave. Interesting results. I have to admit that I would have predicted that they both would evaporate at the same rate. Nevertheless, as I explained above, both of these hypotheses predict moist air will rise (for different reasons). So this experiment doesn't distinguish between these competing hypotheses. Maybe the way to go is to is to allow electricity to be the variable. Does anybody know how to eliminate or control static electricity? I more than just admit it. I shout it from every rooftop. seasmith wrote: As has been observed throughout the centuries, water is very akin to electricity and may aggregate in many forms. Something is keeping indisputably heavier clouds from falling out of the sky. So now you do accept diatomic droplets ! And do you now also accept that all your kerfluphle about the difference between gaseous water and vaporous water is a waste of time ? jimmcginn wrote: Does anybody know how to eliminate or control static electricity? You could repeat the whole process, just enclosing the whole works in a contiguous envelope of aluminum window screening from the hardware store. This would form a "Faraday cage", and completely exclude any static electric field. So it would work just the same, and according to the same principles, as a tinfoil hat. Interesting. But would it eliminate any charge that is resident in the air? This is spot on! Well stated here, Dave. Everything.